Oscar Ribeiro de Almeida Niemeyer Soares Filho (born December 15, 1907) is a Brazilian architect specializing in international modern architecture. He is a pioneer in exploring the formal possibilities of reinforced concrete solely for their aesthetic impact. His buildings are often characterized by being spacious and exposed, mixing volumes and empty space to create unconventional patterns and often propped up by pilotis. Both lauded and criticized for being a “sculptor of monuments”, he has been praised for being a great artist and one of the greatest architects of his generationby his supporters. 1. “Curves attracted me, especially free and sensual ones that evoked memories of old baroque churches. A curve is a beautiful line, logical and gracious, but only if it is well structured and drawn”. 2.” It is not the right angle that attracts me, nor the straight line, hard and inflexible, created by man. What attracts me is the free and sensual curve — the curve that I find in the mountains of my country, in the sinuous course of its rivers, in the body of the beloved woman”. 3.” When planning the government buildings for Brasilia I decided they should be characterized by their own structures within the prescribed shapes. In this way, the smaller details of rationalist architecture would vanish in the face of the overpowering shapes of the new edifices. I tried to push the potential of concrete to its limits, especially at the load-bearing points which I wanted to be as delicate as possible so that it would seem as if the palaces barely touched the ground”. 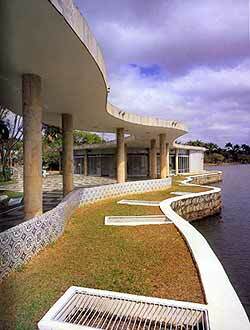 Oscar Niemeyer about Casa Do Baile : “It all began with my first thoughts on Panpulha. 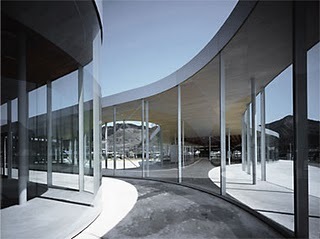 I consciously ignored the highly praised right angle and the rational architecture of T-squares and triangles in order to wholeheartedly enter the world of curves and new shapes made possible by the introduction of concrete into the building process”. past you appreciate a lot? these are an unforgetable ‘trio’ for me. n: coherant, consistant, always doing the same thing. important for us to think about. the size and if it fits into that area. this depends mostly on the area. Geronimo ….thanks for the opportunity to learn a fascinating example of “Conscious Inspiration”..…. This entry was posted on January 3, 2011 at 11:15 pm and is filed under public buildings with tags Casa do Baile Pampulha, civic center of Onishi, eliinbar sketchbook 2011, Oscar Niemeyer, SANAA. You can follow any responses to this entry through the RSS 2.0 feed. You can leave a response, or trackback from your own site.